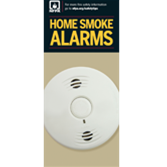 Prevent fires and save lives in your community with the fundamentals of home smoke alarm safety! People in your community need the facts: in half of the fires in which smoke alarms did not operate, the batteries had been removed or disconnected. And, three out of five fire deaths happen in homes with either no smoke alarms or smoke alarms that were not working. With the right knowledge and the top tips for home smoke alarm safety, you can help make the homes and the people in your community a whole lot safer! Now it's easy to get the word out that working smoke alarms save lives with these informative NFPA® Home Smoke Alarms Brochures!